The three new Summit Papers will be released on Saturday, May 11 in Melbourne, Australia at World Stamp Expo 2013. 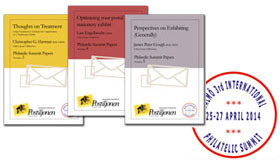 Those not attending can order copies of the new papers, plus #1 and #2, through Postiljonen for €25 plus shipping. 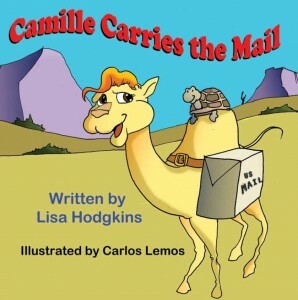 Lisa Hodgkins, librarian for The Postal History Foundation in Tucson has recently published a children’s book entitled Camille Carries the Mail. The story is set in 1850s Arizona and is inspired by the U.S. Army’s camel experiment during which a “Camel Corps” was used to carry freight and possibly letters through the Arizona desert. Camille the Camel is entrusted to carry an important letter but her daydreaming lands her in trouble. With the help of her desert animal friends, Camille eventually finds a way to deliver the mail. Hodgkins was inspired to write Camille Carries the Mail as a way of introducing children to Arizona’s postal history as well as to generate funds for the PHF. The book is for ages 4-9 and is available for $9.99 from the Postal History Foundation or online through Amazon.com and Barnes & Noble. 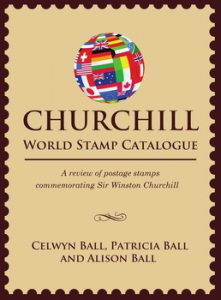 The Essential Illustrated Handbook of Churchill Stamps: A review of Postage Stamps Commemorating Sir Winston Churchill by Celwyn Ball, Patricia Ball, and Alison Ball. Published 2012 by AJBukz Productions. 232 pages, perfect bound (ISBN 978-0-9881605-0-7) or spiral bound (ISBN 978-0-9881605-1-4). Available for CAN$89.95 plus shipping from www.volumesdirect.com. 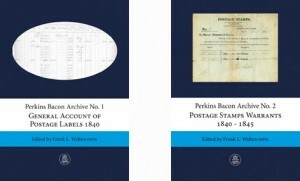 The Perkins Bacon Archive Facsimile is a two-volume set just published by the Royal Philatelic Society London. The Perkins Bacon Archive held by the RPSL is available to researchers for consultation by appointment, but that requires a trip to London. In order to make this primary resource more accessible, the RPSL is making high resolution images available on its website. These books are a reproduction of the General Account of Postage Labels 1840 and Postage Stamp Warrants 1840-1845, and are intended to be part of a longer series with additional titles forthcoming. Perkins Bacon Archive No. 1: The General Account of Postage Labels 1840. 189+xxiii pages. As well as facsimile copies of every page, a summary is provided of the work of every individual named printer. 122+x pages. The RPSL holds 120 original warrants ordering 1d, 2d and VR stamps. These show exactly what was ordered when. The front and back of each warrant is illustrated. Two-volume set: £30 (£27 for RPSL members), plus shipping, from the RPSL. The United Nations Philatelists announced that beginning with the February 2013 (vol. 37, no. 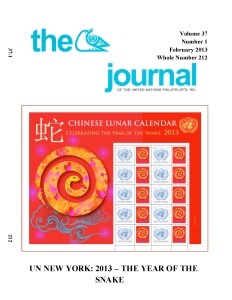 1)) issue of the Journal of the United Nations Philatelists, the journal is being published in full color. This issue is available in PDF format on the UNP website. The journal section of the UNP website also provides access to PDF files of the journal from volume 1 (1977) through volume 34 (2010), an index to volumes 1-34, and the tables of contents of recent issues. Smithsonian Contributions to History and Technology, No. 56: The Winton M. Blount Postal History Symposia: select papers, 2010-2011, the latest volume for the Smithsonian Institution Scholarly Press, is a lively collection of papers that examine postal history. Rarely do scholars of postal organizations and systems meet and discuss their ideas and research with scholars of philately. In an attempt to bridge this gap, the National Postal Museum and the American Philatelic Society hosted the first Winton M. Blount Postal History symposium on November 3-4, 2006 to bring together these two research groups to discuss postal history. The first volume, Smithsonian Contributions to History and Technology, No. 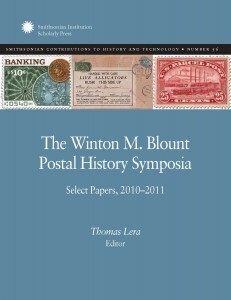 55, The Winton M. Blount Postal History Symposia: Select Papers, 2006–2009 was published in 2010 as is still available. The 135-page, soft bound, full color volume is available free from the Smithsonian Institution Scholarly Press. Follow the instructions at the bottom of the page for sending an email request; be sure to request Smithsonian Contributions to History and Technology, No. 56 (or No.55 if you want the first volume). You may also download the full text as a PDF file. Incunabula, from the Latin cunae meaning cradle, refers to books published during the infancy of printing, usually before 1500.With the growth of stamp collecting in the 1850s, dealers published the first catalogs, albums, and periodicals. This philatelic literature printed before 1875 is generally referred to as our incunabula. German philatelic literature began in 1862 when a stamp album and a catalogue were published in Leipzig. 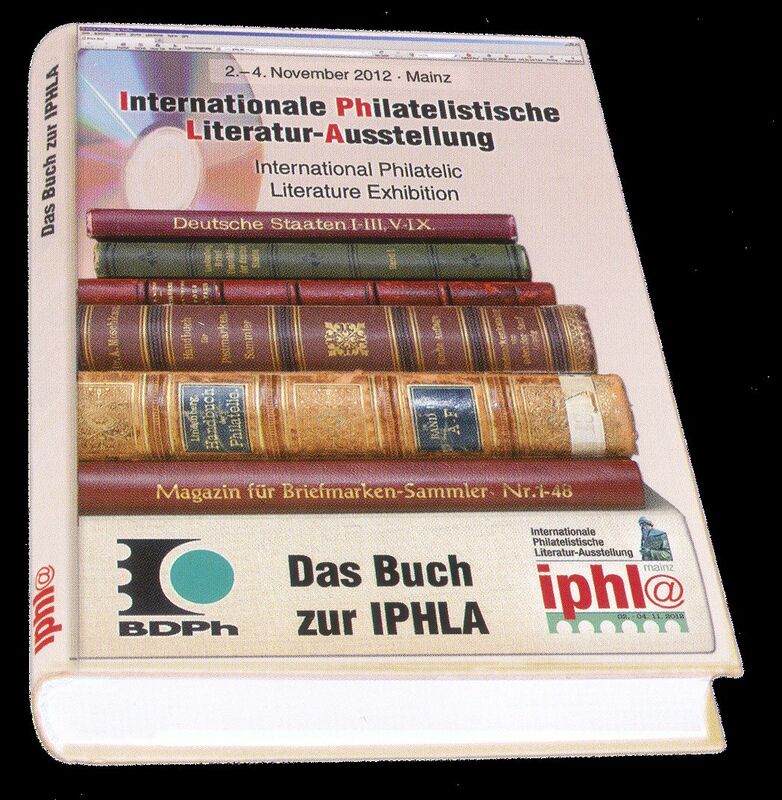 Two books, celebrating the 150th anniversary of German philatelic publishing, are being released in conjunction with the International Philatelic Literature Exhibition, IPHLA 2012, in Mainz, November 2-4. 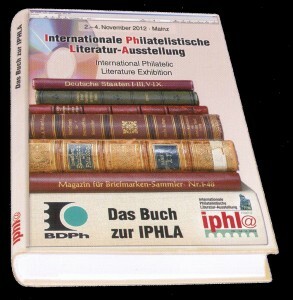 Das Buch zur IPHLA is the official catalogue and guide to the exhibition. In addition to the program details and lists of exhibits and exhibitors, there are 160 pages of essays on philatelic literature. The 320 page, hardcover volume in German is available from Heinrich Köhler for 15 € plus shipping. Wolfgang Maassen, a well-known scholar of German philatelic literature and history has compiled Chronik der deutschen Philatelie: Katalog und Handbuck der philatelistischen und postgeschichtlichen Literatur 1862-1914. 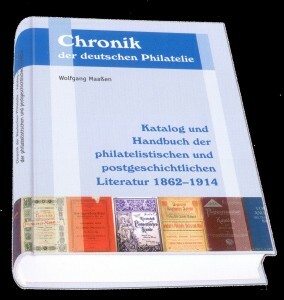 This first catalog of philatelic literature published in German before 1914 contains over 1200 listings, with valuations, for monographs, pamphlets, catalogs, handbooks, and many journals. It will become an indispensible reference work for collectors of early German philatelic literature. The 300 page, hardcover volume in German and English is available from Heinrich Köhler for 24,90 € plus shipping. Savings stamps were an important financial tool to many Americans for sixty years. Purchased with pocket change and accumulated on cards or folders, the stamps provided savers with a method of gathering funds for larger financial goals. 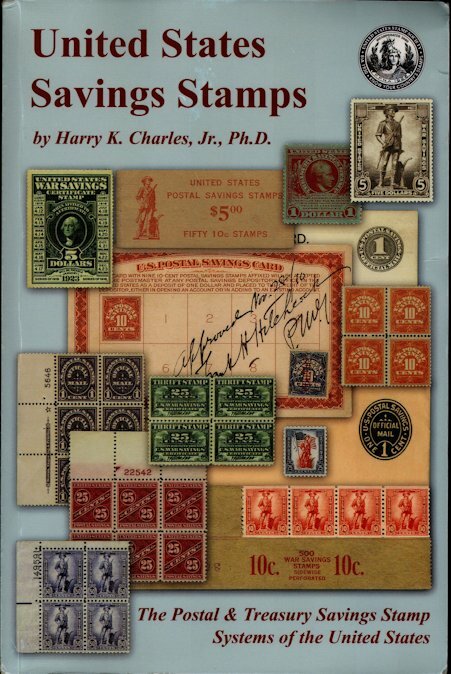 Harry K. Charles has told their story in United States Savings Stamps: The Postal & Treasury Savings Stamp Systems of the United States, published by and available from the United States Stamp Society. Postal Savings was established in the United States in 1910, after nearly 40 years of Congressional inaction. Deposits to open or add to an account were only accepted in whole dollar amounts. The 10¢ Postal Savings stamps facilitated accumulation of a dollar for a deposit. The Post Office created this savings vehicle at a time when many communities lacked a bank and periodic bank failures (more than two decades before FDIC insurance) caused considerable distrust of banks among many. Since European governments had offered postal savings for decades before the United States, the program was familiar to and popular with many immigrants. When the United States entered World War I, a few years later, the Treasury Department needed to borrow billions of dollars. The Post Office played a major role in the sale of 25¢ Thrift Stamps that could be accumulated to purchase $5 War Savings Certificate Stamps that paid 4% interest at maturity. Treasury stamps were important for financing both World Wars as well as the Cold War. All remaining Postal Savings accounts were closed in 1966 and the sale of Treasury Savings stamps ended in 1970. 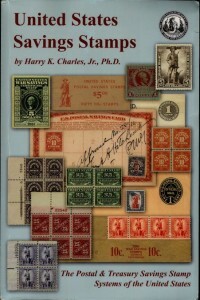 The book provides much more than merely the details of the stamp issues. Harry has included the regulations, savings cards, post office forms, meters, slogan cancels, and a very nice chapter on the ephemera used to promote these stamps. 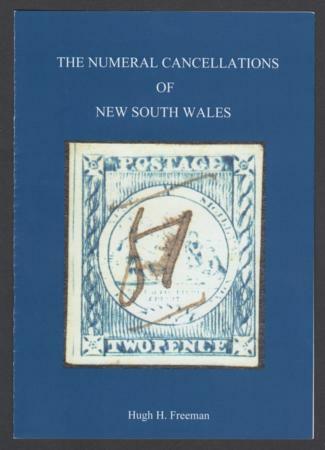 Hugh Freeman’s newly published book is the first to provide rarity ratings for the numeral cancellations of New South Wales. The hardbound book is 400 pages with 2,000 color illustrations and includes a dust jacket and computer disk. The book is published by the Australian States Study Circle of the Royal Sydney Philatelic Club. Available from the Australian States Study Circle, GPO Box 1751, Sydney, NSW 2001, Australia for $AU160 plus shipping. Also available from from Torsten Weller and Glen Stephens Stamps. A new book tells the story of Estella Weaver Nukes and the special quilt she made for stamp collecting President Franklin Roosevelt. 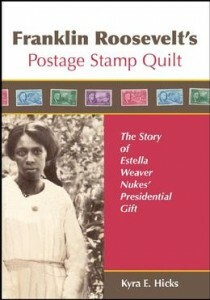 Author and quilt historian Kyra E. Hicks told me she had no idea of Roosevelt’s passion for philately until she started researching Franklin Roosevelt’s Postage Stamp Quilt: The Story of Estella Weaver Nukes’ Presidential Gift. The 44-page full-color paperback is available from Amazon.com for $12.95 (ISBN 978-0-9824796-1-2).